Dear Professor Stephen Hawking. I wish to thank you. Thank you for your determination and stubbornness in life which is an inspiration to us all. I received your message addressed today quite well: "Be curious"(I am) and "Don't give up!" (I won't). This is why I decided to paint this second portrait of yours after this first one (end of 2009) after we met the year before. Creativity is a very complex and “uncertain” activity. I tried then many different solutions/ compositions to convey both your personality and the scientific issues and challenges that have occupied your entire life. I eventually destroyed these first compositions (see right-hand side picture) but decided to come back to one of them with a new approach based on my current research regarding C.P. Snow’s “Two Cultures” question : what is apparently dividing Arts and sciences and why so? 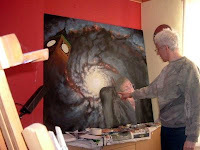 This portrait's background is an attempt to illustrate this crucial paradox (yet real) between two theories; the quantic and the relativistic laws of our Universe. I decided to "superpose" patterns from particle collisions against patterns from nebulae/ galaxies, … with us humans, the very complex ones, in between the very large and the very small scales. You are standing where “human complexity” does. There are many winks in this portrait. Besides Professor Hawking's, there are both artistic and scientific winks too. A few weeks after my 2012 portrait, David Hockney was invited to do his portrait of Professor Hawking to celebrate his 70th birthday. It is now part of the Science museum exhibit. I also submitted my portrait at this year 2012 BP award of the National Portrait Gallery (NPG). This was the second reason why I finished it this January (the first being Professor Hawking's birthday). Why NPG? 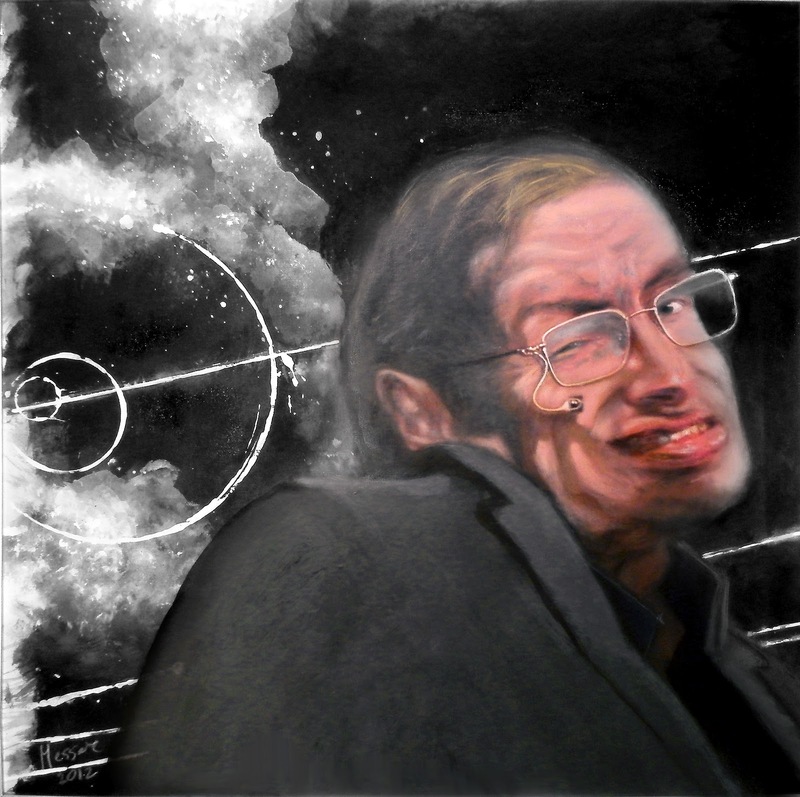 To give its curators and director an opportunity to redeem themselves after having commissioned Professor Hawking's portrait in 1985 to Yolanda Sonnabend who delivered a very poor portrait. When visiting NPG, this portrait became my motivation for contacting him in 2008, and to learn we shared the same views on this poor portrait by Sonnabend. The 2012 BP award rejected my submission. I posted a few days ago a comment on an article at http://sciencemuseumdiscovery.com/blogs/insight/science-museum-unveils-new-hockney-ipad-portrait-of-professor-stephen-hawking/ congratulating David Hockney for his portrait of Professor Hawking done at the occasion of his 70th Bday and exhibited at the science museum. I also informed them I did his portrait for the same occasion since I met him personally in 2008 to start then another portrait. This was part, as I explained him, of a project of dialogue between artists and scientists, an answer to C.P. Snow's "Two Cultures" question.